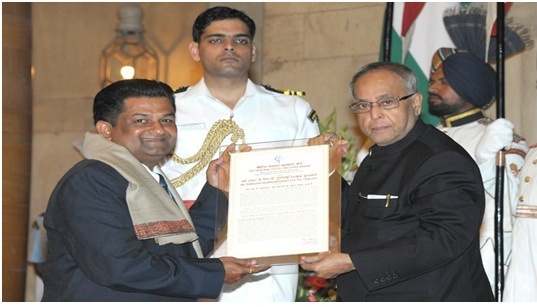 The President of India, Shri Pranab Mukherjee, conferred the tenth Dr. Durgabai Deshmukh Award for the year 2007 to Snehalaya of Ahmednagar, Maharashtra today for its landmark work in the rehabilitation of women & children of the red light areas and other destitute women & children in difficult circumstances. Snehalaya has successfully intervened to rescue hundreds of girls and women who were caught in the quagmire of prostitution and has rehabilitated them in the mainstream of society. The award carried an amount of Rs. 5 lakhs, a citation and a shawl. The President of India, Shri Pranab Mukherjee, called for concerted efforts by Government, private and voluntary sectors for the development of the weaker and vulnerable sections of our society. He pointed out that the Government of India, through its programmes and policies has engineered a major directional change in public policy by its focus on inclusive development. He expressed confidence that the organizations who have won awards will inspire hundreds of other organizations like themselves, located all over India - in rural as well as urban centres. The President was speaking on the occasion of the presentation of the Dr. Durgabai Deshmukh Awards for Women’s Development for the years 2005, 2006 and 2007 today (November 5, 2012) at the Darbar Hall of the Rashtrapati Bhavan. Delivering the keynote address at the event, Smt. Krishna Tirath, Minister of Women and Child Development, said that Dr. Durgabai Deshmukh was the mother of social service in India and the visionary founder Chairperson of the Central Social Welfare Board. She noted that Durgabai Deshmukh was a feminist, a Parliamentarian, an administrator and a great visionary. As a Member of Parliament she carried out programmes for educating, training and rehabilitating needy women and children. "Dr. Durgabai, in her unique way, demonstrated to the world that women, through co-operative endeavor, could achieve the vision of universal opportunity and justice for society," the Minister added. She congratulated the awardees for their work for the needy. The Minister said that the Ministry of Women and Child Development is committed to supporting the Board & Voluntary organization in all its endeavors. Among the other dignitaries present on the occasion was Smt. Prema Cariappa, Chairperson, Central Social Welfare Board.